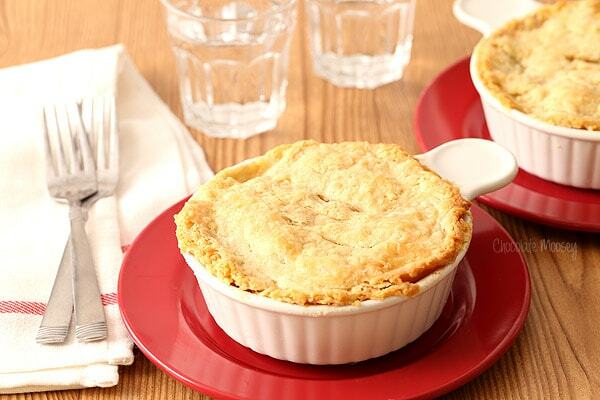 Chicken Pot Pie For Two is baked in two ramekins or two 6-inch round cake pans and topped with a homemade pie crust. It’s an easy chicken dinner for two without having leftovers for days. Since I almost always cook dinner for one, one of my biggest challenges is scaling down recipes that aren’t straight-forward scalable. I don’t mind leftovers as it gives me lunch to eat the next day, but I don’t want to be eating the same leftovers for a week either. As an adult, one of my favorite comfort foods I crave is chicken pot pie. I have my go-to Chicken Pot Pie Casserole recipe I love to make. However, I don’t make it often because makes about 6 servings or so. I make it for when my family visits, but not for an everyday meal. That got me thinking – how can I scale pot pie down for two people (since that second one will be tomorrow’s lunch)? Back in September, I made apple pie for two complete with pie crust from scratch. That became my starting point for this Chicken Pot Pie For Two recipe. 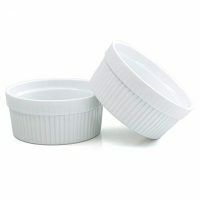 However, as I stared at my 6-ounce ramekins, I started thinking they wouldn’t be big enough. As I dug in my pantry, I found two 12-ounce ramekins. A little bigger than I liked, but they did the trick. I’ve made it several times since in two 6-inch round cake pans, just in case you don’t have large ramekins. But I did it! 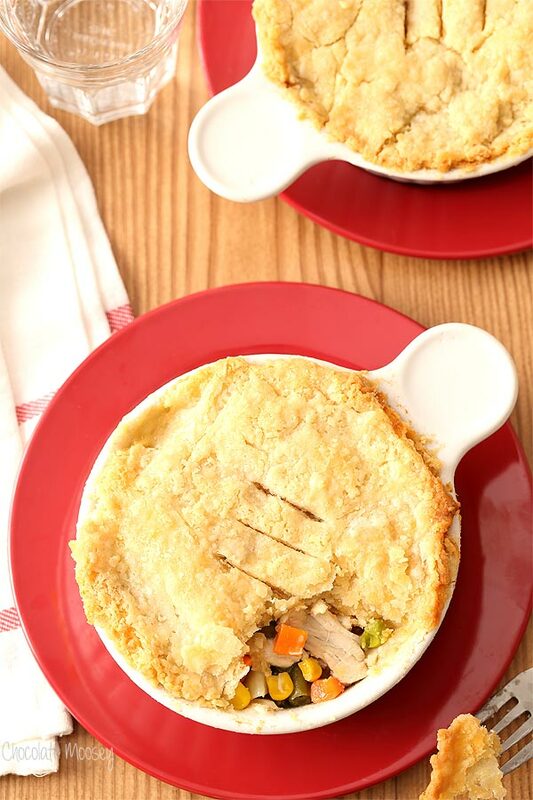 Everything you want in a traditional pot pie – buttery, flaky pie crust; hearty, creamy filling packed full of chicken and vegetables – scaled down to a dinner for two. 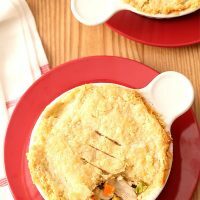 Traditional pot pie is two layers of top and bottom pie crust stuffed full of creamy chicken and vegetables. I’ve done different variations with homemade biscuits and puff pastry, but I wanted to stick with the pie crust. Don’t let that scare you! Yes, it’s made from scratch, but I bet you can make it faster than running to the store for a box. If you use your food processor, the dough comes together in 5 minutes. If you don’t have a food processor, you can add the dry ingredients to a large bowl then cut in the butter and shortening using a pastry blender or two knives. Stir in the water and voila! You have pie dough. The taste of homemade crust is unbelievably better than store bought because it’s much flakier and more buttery, almost with a melt-in-your-mouth texture. This is a result of using both cold shortening and cold butter. Shortening gives the crust a flakier texture because it has a higher melting point than butter. Butter gives the crust its well known buttery taste. As a small batch baker, I usually buy one stick of shortening and keep that in my freezer. The only time I ever bake with shortening is when making pie dough, so I don’t need to buy a huge tub. However, if you find yourself without shortening in your pantry, you can do an equal substitution of butter. It may not be as flaky, but you won’t be disappointed either. Homemade pie crust is also very forgiving, so if you have a little trouble rolling out your dough in one piece, you can easily patch everything up together. If the top gets a little patched up, call it rustic pot pie. Problem solved. One of my pet peeves is when a recipe calls for already cooked chicken. That’s great if you have leftovers, but as someone who cooks small batch, that rarely happens. When I was learning how to cook, that meant figuring out how to make the chicken first before proceeding. I don’t want you caught off guard with the hidden prep. And I know there are some novice cooks out there who need a little extra guidance. That’s why I included cooking directions in my recipe. The directions may seem long, but luckily you can multitask. While the chicken is boiling, make the pie crust and stick the dough in the freezer. Then prep all of your knife work for the filling. Of course you don’t HAVE to boil the chicken. Want to make it in the Instant Pot? Fantastic! Ready to fire up the grill? Perfect. Too much prep for you to handle in the one day? No problem! Cook the chicken and/or make the pie dough on a separate day. One question I get is which chicken piece should you use? Honestly I think dark meat is best, so I usually cook chicken quarters or thighs. However, you can also use chicken breast. I recommend using bone-in breast because the bone will add more flavor than boneless chicken breast. My favorite part of pot pie is the creamy chicken and vegetable filling. Chicken is my favorite, but you can easily substitute beef and beef broth for a beef pot pie or even portobello mushrooms and vegetable broth for a vegetarian pot pie. Picky about your vegetables? Add only the ones you want. Got leftover ham? Throw that in there too. For the vegetables, I individually prepped the carrots, potatoes, peas, and carrots. However, if I’m in a hurry, I’ve used a frozen vegetable medley featuring carrots, peas, corn, and green beans. I know not every household owns small size baking vessels, so I tried to make this recipe as flexible as possible. If you find yourself cooking for two often, I highly recommend investing in ramekins and casserole dishes. Go to your local thrift stores and check out what they have to offer first before you hit the retail stores. I think all but one dish I own are used. Only have 6-ounce ramekins? Make four mini pot pies instead of two. They don’t have to be individual dishes either; I have a 5×7 casserole dish that I did buy new at a local business (as seen in my apple half slab pie photos). 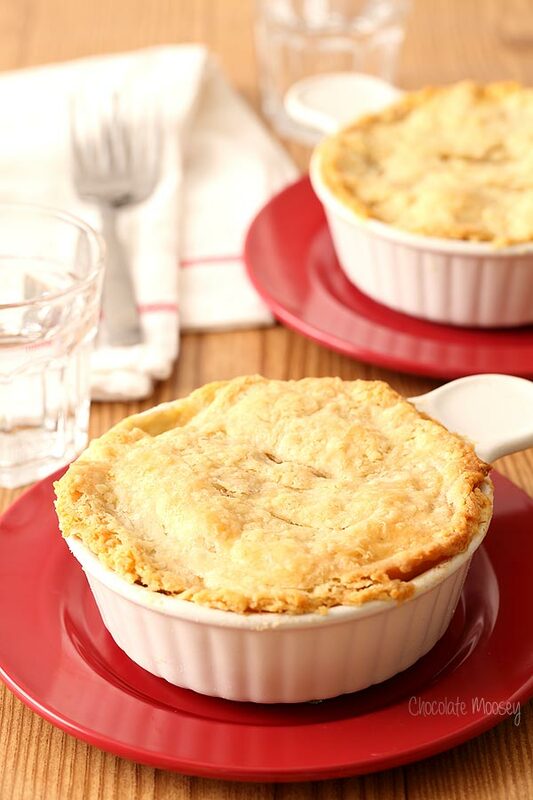 With all of that said, you can make this pot pie recipe in two 6×2 inch round cake pan or one 8-inch round cake pan. As long as you leave the proportions the same, you can make pot pie for two your way. Since I cook for one most days, sometimes I’ll freeze the extra pot pie for a future dinner. Before baking: After you finished assembling the pies but before baking, freeze them in the pan until firm, about an hour. Wrap in plastic wrap then stick in a freezer bag. Freeze for up to 3 months. When ready to eat, bake frozen in a 375F oven for 50 minutes. After baking: Cool the pies completely. Wrap in plastic wrap then stick in a freezer bag. Freeze for up to 3 months. When ready to eat, bake frozen in a 375F oven for 30 minutes. Add chicken to a large pot and add enough water to cover by 1 inch. Add a big pinch of salt then bring to a boil. Once boiling, turn the heat down to a simmer and cover. Cook 20-40 minutes or until the internal temperature of the chicken reaches 165F. Drain the water and let the chicken cool. Once cool enough to handle, shred the meat off of the bones, discarding skin and bones. While the chicken is cooking, make the crust: In the bowl of a food processor***, add the flour and salt. Add the cold butter and shortening and pulse until butter and shortening are cut into the flour, looking like small pebbles. Add the water and pulse until a dough forms. Divide the dough into four even pieces and flatten each piece into an evenly round disk. Wrap in plastic wrap and refrigerate at least 1 hour or until cold. Once cold, take one dough piece out of the refrigerator. On a lightly floured surface, roll it out large enough to line the bottom of one 12-ounce ramekin or one 6x2 inch round cake pan. 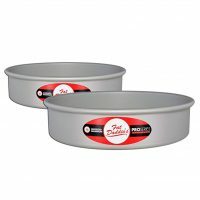 Roll out a second dough piece to line the bottom of a second 12-ounce ramekin or 6x2 inch cake pan. Roll the third and fourth dough pieces out large enough to cover the tops but don't cover them yet. Wrap them back up with plastic wrap then place those and the ramekins back in the refrigerator while you make the filling. In a Dutch oven or another large pot with a wide bottom, melt the butter. Add the onion, carrot, and a big pinch of salt. Cook until softened, about 5 minutes. Add the garlic and cook 1 minute. Stir in the flour and salt to make a roux (paste), then slowly whisk in the broth. Bring to a boil then add the potatoes. Cook for 8 minutes, stirring often. Add the peas, corn, and cooked chicken. Cook another 2-3 minutes or until the potatoes are fork tender but not overcooked, stirring often. Stir in the milk. Taste and add more salt, if necessary. Take the ramekins out of the refrigerator and divide the filling between the two. Top each pie with the remaining dough pieces. Cut a few slits in the top of each one to let the steam escape. Bake for 25-30 minutes or until the tops are golden brown. Cool for 15 minutes then serve hot. *Already have cooked chicken on hand? Use 2 cups cooked shredded or chopped chicken. **If you're looking to save prep time, you can substitute 2 cups frozen vegetable medley for the carrots, corn, and peas. Stir in with the cooked chicken and heat until hot. ***If you don't have a food processor, add the flour and salt to a large bowl and cut the fat in by hand. Stir in the water until a dough forms. This is perfect for date night or just to clean out the fridge. I love the comfort of chicken pot pie! This sounds good, but I am very surprised not to see any kind of herbs or spices in it, other than onion and salt. I’m leaning toward adding some thyme and or sage. Curious about your thoughts on that. Thanks, Carla. From what you said, I think I’d try it first as written – generally a good idea with a new recipe, and especially from what you said. I’m the same way! I rarely do sides and it is so difficult for when Michael wants like…a real dinner lol. and these pot pies are perfect! Great looking recipe! Love the scaled down serving. I love homemade chicken pot pie and it has definitely been on my list of things to revisit soon. Great idea to make a 2-serving version. While I love leftovers it’s nice to not be overflowing with it with things such as this that normally feed a larger group. I have to try this recipe.. Loved it..
How does the bottom crust brown , do I bake it first? No need to bake it first. The heat circulating in the oven will bake it. Since they’re served in ramekins, no I didn’t go all the way up the sides. If you feel you have enough dough to do so, you certainly can.